Provocative Tangerine Tango, an enticing juicy orange, is a vivacious and appealing refresher to enliven anyone's outlook this spring. One of the hot new colors for spring 2012 is Tangerine Tango, according to Pantone's spring color palette announced last fall. Tangerine is a bright orange that is tempered by a hint of blue to tone it down. Tangerine Tango can be used as an accent color for men and women in handbags, belts, scarves, and shoes, or it can be a splash of color in a spring or summer dress, blouse, polo shirt or blazer, perking up your mainstay wardrobe. This is a color that is a must have for this spring, and you will not want to miss your chance to pick up at least one item in Tangerine Tango. After months of cold, dreary weather, the bright colors of spring make a difference in your mood no matter what part of the world you are from. Tangerine is a color that evokes both spring and summer floral colors, and the juicy taste of a delicious tangerine fruit. Tangerines are almost as bright as oranges, yet just a bit held back in color, not quite as yellow, and definitely sweeter in taste. 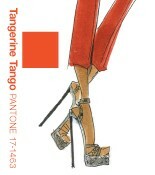 That is the mood of Tangerine Tango, a bright cheerful, bold color that is appropriate for both men and women. Tangerine Tango will wake you up, and keep you going, just like a bite into a fresh tangerine would. styles and lifestyles, from free and playful and light and breezy, to contemporary classics. Colors likewise reflect these differing moods, encapsulating vivid brights, soft muted tones and fun-loving pastels. "Consumers look to spring for renewed energy, optimism and the promise of a brighter day," said Leatrice Eiseman, executive director of the Pantone Color Institute®. "They have learned how color can help them alter a mood and provide the vitality and enthusiasm that enables them to experiment with new looks and color combinations." Dress features a v-neck, sleeveless with belted waist. Personally, I like a lot of color, but I am an artist, so color motivates me. I see Tangerine Tango in accents of color, handbags would be the biggest place, and for working women, a bright tangerine jacket or shell. For men, I love the look of the tangerine polos pictured here, or the belt to just add a bit of color. Partnered with any blue, this color will jump out in a good way. If you have an occasion to wear an evening dress, there are some really gorgeous choices in solid tangerine, but also in prints that include the tangerine, blended with other colors in the spring palette. These will go well for this spring, but also into the summer easily. If You Can Only Pick One Tangerine Item to Add to Your Wardrobe. . . If you have to choose just one item, for women I would choose a tank or shell to wear with many different outfits or a stand out handbag in tangerine. For men, the tangerine polo is a must. You can wear it on casual days at work, or out to a casual dinner. Either of these choices is affordable. Love tangerine orange for any spring accessory. Also love it in combination with a lime green or bright fuchsia for weddings. Beautiful!